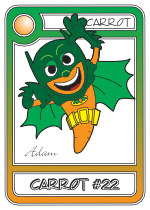 Killer Bunnies and the Conquest of the Magic Carrot® is a stand-alone game that can be mixed with Killer Bunnies and the Quest for the Magic Carrot®. Which cards affect an “Angel Wing’ed” Bunny? A table showing specific card interactions with an “Angel Wing’ed” Bunny. This site is designed to be compliant with World Wide Web Consortium (W3C) standards. If it doesn't look right, you're probably using Microsoft’s Internet Explorer. Please upgrade with Firefox, Opera, Google Chrome or Safari to be standards-compliant.